It’s that time of year again. There are three peregrine falcon eggs in the nest on San Jose City Hall, and the first one started to hatch this morning; you can see the chick moving in there. Video of the new little one here and reports are that the next one has apparently started to pip (break through with its egg tooth). To life! Sunday School and the subject was the feeding of the five thousand that had come to the hilltop to hear Jesus speak and now had a long journey home ahead of them. Jesus told his disciples he didn’t want them fainting from hunger along the way, we needed to take care of these people here. The story goes on to say that after the blessing and after all had eaten, in the hands of God that young boy’s gift had become twelve baskets’ worth of leftovers. And the thought occurred to me and I raised my hand, remembering how much young teenage boys eat and what a sacrifice that might have been, varying with the actual age of the kid. And I’m sitting here thinking, I need to always remember to be ready with that first basket. In whatever form it needs to come in. To see in the moment and not think of myself first. One can only hope. The Bababerry that was a dry-looking stick a few weeks ago. The grower’s description, here. So I have someone I need to knit for, and I’d settled on a type of yarn that I thought would work well but not a color. I’d narrowed it down pretty much to two. They were cones of silk from Colourmart2.com and still in the thick plastic bags they’d come in. I hesitated and finally ripped open the one on the left and tucked it into a ziploc with needles for an errand where I was likely to have to sit and wait awhile. Colourmart’s bags are more bug proof than mine and I like keeping the yarn in them till I’m ready to set it to needle, so, this was supposed to end my inner debate once and for all. It did, actually: the instant that thing was open I felt a surprising pang of disappointment–but I ignored it and kept getting it ready for my errand, where, it turns out, I did not have time to knit a single stitch. And the longer I carried that cone around the more certain I was. Well then. Now I finally knew: the other one is the one. Clearly. 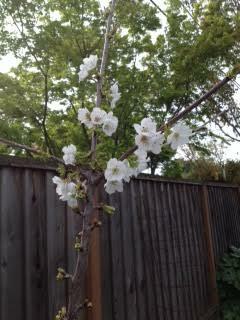 New flowers on the sweet cherry–we’ve gone from only at the very top to continuing on down. I feel like I can never get enough of those flowers. Some of the earlier ones are starting to throw sweet confetti. Top, right, and left, I’m trying to give a better sense of the whole of the mango. The new buds at the top? They weren’t there at the beginning of the week. We had a three-day heat wave and it actually hit 94.7 degrees yesterday–in March. So strange. The plant life took off all over the yard. I have no idea how many actual mangoes, if any, we’ll get this year but it looks promising and the honey bees are definitely trying their best. He was about a year old when we moved here and his parents were some of the first people we met. He’s the kid who, post college graduation (he’s back now for grad school), took a job for awhile in Texas such that we utterly randomly ran into him at church in Ft. Worth while we were visiting my in-laws. Out of all the places in all the country and to end up in the same room at the same time… Our jaws hit the ground in unison. Such a great kid. Yeah yeah yeah, so, I knew him when, as well as some of the other kids in the video who also grew up with mine. Don’t know if you’ve seen it yet but JK Rowling herself called this brilliant and how cool is that?! He mashed Bruno Mars with Harry Potter. Keith plays Harry (direct YouTube link). And if you watch it over here you get to find out more about that python whose face his buddy sang to. I was ecstatic: I’d done the taxes and I’d done them in under four hours. This has never happened before. Richard knew of one other number we needed–and it was right there, page two in the stack. Done. 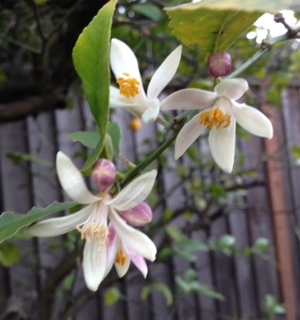 The Meyer lemon burst into bloom in celebration–there were no flowers yesterday, but, look at it now. Crumpled sharp-edged eggshells around a trunk or stem are the easiest, most benign way to keep snails and slugs out of what you’re trying to grow. And so I had to make that chocolate hazelnut torte. Had to. 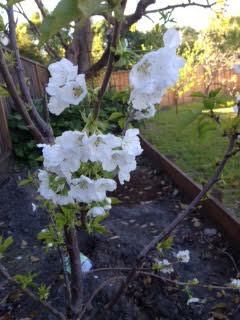 My future fresh-picked peaches depended on it. Today’s Sunday School teacher, whom I happen to be married to, was talking about the parable of the sower who tossed his seeds along the ground as he walked, hoping for a good crop later. You’ve probably heard that one. The text was read and then the poetry of it was discussed, metaphor by metaphor, soil types, marauding birds (what, no squirrels? Do you know how fast they dug up the sugar snap pea seeds I put down?) the part about the lord of the harvest saying, no, don’t pull out the tares or you’ll uproot the wheat along with it, let them keep growing together till they’re ripe. The growth habits of rye and wheat plants were mentioned and we had a visiting rancher from Wyoming on hand (what were the chances!? Never seen the guy before) who talked about how they are mechanically separated now at harvest with the machine being able to tell which is which. Cool. Learn something new. While part of me was wondering, two thousand years later they’ve *still* got their seeds mixed? Couldn’t be by much, surely. Clearly there was a lot more to ask the guy but it wasn’t the time or place. Then the general query was thrown out there: So what did it all mean? I raised my hand and pronounced: Having planted a few trees this past week, if you want them to produce well then by golly you’ve got to have slimy earthworms and chicken manure in there. Yup. Every life has to have some for the person to grow into the best they can become. It’s all just part of how it is. I’m smaller, I fit better under there–let me give it a try. Okay, that makes it sound like I volunteered a lot more enthusiastically than I did. It was definitely not going to be comfortable with the lip below the counter digging into the small of my back but the job needed doing and I had nothing to complain about vs what it would be like for him. We put a folded towel over that edge down there. My hands aren’t strong, though, and as I tried to tighten the nut on the right bolt as best I could I dropped it again and again: my arms were simply too short. The nuts had not only come loose, the big brass washers to either side had actually fallen out. How, I don’t know. This was a new faucet as of December. Being that tall and squeezing under that bathroom sink in that space was definitely a challenge–but he did it. When he got all done I suddenly noticed that the faucet above was off. Like, WAY off. I tried to describe it for him, wedged under there, and he, realizing it meant undoing both sides, kind of pleaded for it to look good enough. A half to three quarter inches skewed to on side, that doesn’t sound like a lot, right? He knew. He lessened his grip on the idea of finally being done: So we really do need to undo and start over? I knew we should have been looking at it from top and bottom, says he. This time he simply stayed crammed with his head at a painful angle behind the U-tube till it was done rather than asking me to spell him. He tightened up the last of it far faster than I ever could have done. Hopefully there will be no more leaks, hopefully the faucet will stay solidly in place now. My hero! I exclaimed as he stumbled out and to his feet, and I meant it. My hero, I repeated emphatically. Given how strong his big hands are, having his being the ones holding that wrench this time means we won’t have to do this again. Hopefully. 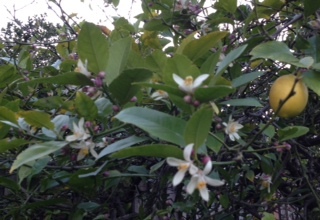 The first Fuji apple flowers burst into bloom today–and yesterday I couldn’t even find buds, I looked. Pushing around half-barrels full of soil and plants (fig, raspberry) the last two days to test sun hours may not have been my best move–I woke up at dark o’clock in shooting streaks of oh-no-you-didn’t. Wait, *I’m* not the one with the bad back. Come the morning I took it easy and sat up straight and did all the right things and as the day went on the twinges faded out. Y’know, I’ve really badly wanted all week to plant that Gold Nugget mandarin and it’s not healthy for it to stay in that small nursery pot too long, thought I. Dinner was ready to go. Richard wasn’t home yet. I picked up the spade–okay, that felt pretty much okay–and walked over to the spot the two of us had agreed on. Just like the one time I’d tried before, that hardpack seemed utterly impervious to anything I could do to it; the metal tip wanted to simply ricochet off. Just one little bit to mark the spot? This was one chore where I could simply stop any time if I needed to. I even had, once. Yeah who was I fooling. Suddenly I was finding that it was just that top layer that was difficult, it was beautiful, soft soil underneath and there was the spade sliding right on through it. All those years of accumulated buckthorn leaves had done some real good over here and the earthworms I encountered thought so, too. I didn’t hit the water line this time. I picked up the pot (okay, that was pushing it a bit) and set it in the hole a moment to see how it was coming along. Ideally, I should dig wider; it was wider than I thought, though. Ideally, it should be deeper. Actually, I was going to have to fill it back in a bit. And since it’s not all clay here the roots should be just fine. Richard got home and let me drag him out there to be part of the final decision process. He didn’t tell me I shouldn’t be doing this quite yet; he knew how badly I wanted to. It’s just one day and then we have a healthy tree for life. I sprinkled some olive-tree shavings across the bottom, added bagged soil, the mandarin, water, more bagged soil, and at last a ridge from the excavated soil to make a moat around the trunk. More water. I did cut back the scraggly old bushes that were peering over the edge of the hole in that picture earlier. The temperature hit low enough that the lights on the mango next to it clicked on in the dusk. It is done. I cannot tell you how good it feels. Grow little tree grow! Learned something new today. 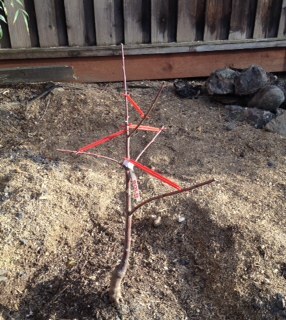 Those spacers I bought to try to reposition fruit tree limbs with just a little? Our English Morello cherry’s pruned and shortened branches were quite stiff and quite determined to stay as upwards-facing as possible last Saturday when I planted it. Like I mentioned, that can lead to broken boughs in years to come so even though there wasn’t much to anchor them against I did what I could with some of the smallest spacers to try to stretch the wood earthward a bit. Tonight I went out to see if by very small chance I could reposition things a little. I truly did not expect to. I could. Rather easily, actually, I could even get a medium spacer in one place now and the angles are noticeably improved. Who knew that making a few very small changes and allowing it some time would help it become flexible enough to accept the better points of viewing to come? Sun, sun, watching its path… Huh! Going down the fence line it’s low light at the corner, high light (where the mango is)–I knew that–but then kind of middling and then back up to high where the new cherry is–so in between those two high points is a lower one. Who knew. I’m thinking, the fig is deciduous so, no, put that in that spot where it won’t bother it if there are slightly fewer minutes of direct light in the winter (even after digging that hole a foot further forward yesterday) when it’s going to be bare anyway and then put the Gold Nugget mandarin between it and the mango and it’ll be happier. I’m glad I gave myself time to observe the interplay between the heights of those trees as they are now and those rays before planting. All of which is an excuse to show more photos. 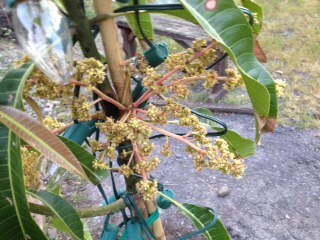 The fig starting to leaf out, some of the mango clusters, the Stella cherry with a few more blossoms open. Re the knitting. For someone I’ve never met before but who’s about to become an in-law, silk is the safest yarn to reach for in terms of the odds of pleasing them and not running into allergies, right? I was watching the path of the sunlight closely today, moving the mandarin pot in and out of the hole I’d dug so far, and decided that it was going to have at least a half hour to maybe even an hour in the winter more direct sun if it came forward about a foot; all I had to do was dig a little more. The more hardpack clay replaced for its roots to grow into the better anyway. The Gold Nugget variety we bought, it turns out, survives to 26F, six degrees colder than almost all the other varieties, it produces in the early spring rather than winter, the flavor is supposed to be intense, and then, unlike some, the fruit can simply wait there on the tree for months without rotting. Ready when you are. Eating a perfect tangerine right off the tree in July? No problem. I would say we totally lucked out when we got that one. There was a meeting at church tonight and having just put down my tools since I can only be outside in low UV I decided I was too tired to drive; Richard said no problem, and off we went. And so I got to be the passenger and thus put my full attention on it. We were pulling through the big driveway there when I suddenly exclaimed. He had no idea why. A little further and he stopped by the door and then asked what that was all about. No, I didn’t, what was it? A Cooper’s hawk and some smaller but not small bird were doing a crazy-fast slalom race across the parking lot and over and around our car, in such tight formation the whole time that at first glance I had not been able to tell it was two birds. They were right there at the passenger side! I wasn’t the only one watching, I realized as I got out of the car and looked up. C A W W W. There were two ravens at the top of a tree watching, knowing that hawk would win and waiting, two-on-one, to mob it and steal its hard work the instant they could. Only, our car had blocked their view a moment and I had spotted them at it. Corvids are always very interested in what humans are doing–they’ve survived via scavenging from people for millennia. They turned their attention to me and spoke up some more, conversing with either each other or me or who knows. And with that diversion, the hawk wasn’t forced to give up his meal for his mate and his nestlings, wherever he might be now. His.